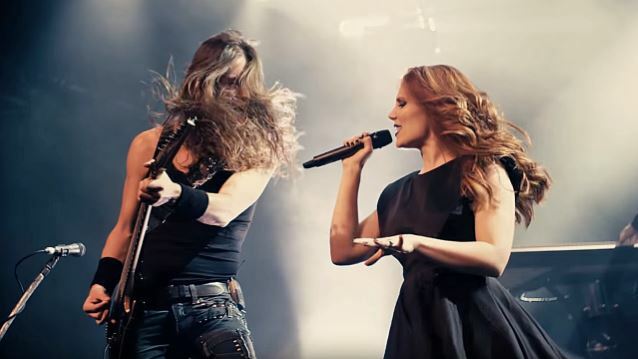 "Moshpit" show, which airs on the SYN 90.7 radio station in Melbourne, Australia, recently conducted an interview with guitarist/vocalist Mark Jansen of Dutch symphonic metallers EPICA. You can now listen to the chat below. A couple of excerpts follow (transcribed by BLABBERMOUTH.NET). Mark: "At the moment, we're recording the strings, and right after, the choirs we'll get to record and the brass. So we are getting into the final stage of the recordings. And the drums, bass, guitars, pianos, everything has been recorded already. And after the [Australian] tour, we will record the lead vocals of Simone [Simons] and my grunts. And then it's already basically time to start the mixing process pretty soon." Mark: "The biggest difference, I think, is, on 'The Quantum Enigma', we already used real strings but still samples for the brass. And now, with the new album, we do everything we possibly can live, so also the brass section… we hired a brass section to play all the brass parts. And I think the album will also really benefit from that. Even though samples are, live, nowadays so good, but still, if there's real people playing the music, it makes still a big difference. So I think that will be the biggest difference." Mark: "I think we learned lot. We always made music we really felt like making, so we never listened to what was popular at the time, or what other bands were doing. But we developed, I noticed, in a different way than most bands around us. When this female-fronted scene was pretty big back in the day, around 2000, many of these bands became more commercial later on, and we always developed in a more… we [went] more in a metal direction. And many people, at that time, said, 'You are crazy. You are ruining your own career.' But now when I look back, I think that was… Even though we did just what we felt like doing, but it was smart, actually, because that made us stand out, and that's why we're also still around and still growing. So, I think, at that point, people thought it was a stupid move, but it appeared to be a good one." Mark: "It's always a challenge, that's for sure, but, for some reason, all the elements, they fall automatically [in the] right [place]. It's hard to explain, but after all these years, you find a way to make it naturally work. So back in the day, it was more like a puzzle, a search, and now it naturally happens. So still sometimes we discuss, 'It might be better to have a choir here instead of Simone singing,' or, 'Maybe we should not use grunts here.' So these little discussions still happen, but usually it's quite obvious where we're gonna put what. But sometimes it's even good to still experiment a bit, because it's always also good to go off the path and try and explore new things. And with every record we also try that, and we sometimes try ideas that at first seem ridiculous but then still work out. So that's also [something] we learned — that we try out everything, ever ridiculous ideas, that seem ridiculous, and later on appear to be a great idea. Because that's the way it works. You should never say that something doesn't work before trying it." EPICA's next album is tentatively due in September.